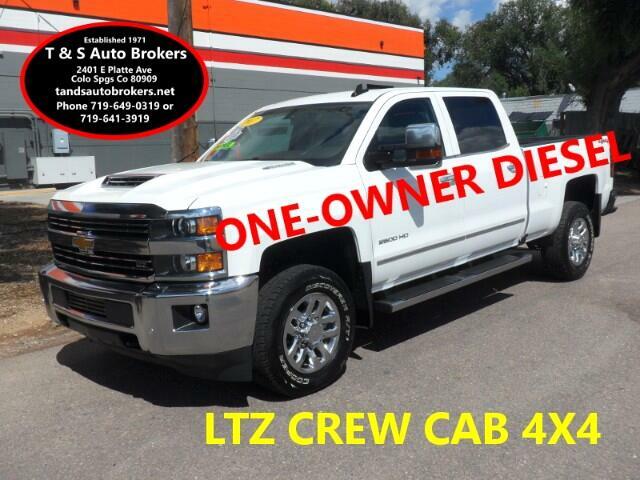 ONE-OWNER, DURAMAX DIESEL, 4X4 LTZ, CREW CAB, NEW CAR TRADE-IN-NOT FROM AN AUCTION, CLEAN CARFAX. 55K MILES. WE WILL CONSIDER SOME TRADE-INS. ***TRUCK STILL UNDER THE FACTORY 5 YEAR/100000 MILE POWERTRAIN WARRANTY***EXTREMELY NICE TRUCK, EQUIPMENT INCLUDES: 6.6L V8 F OHV 32V DIESEL ENGINE, ALLISON 6 SPEED automatic transmission, leather interior, heated front seats, AC, dual zone climate control, CD, navigation, Bose audio, dual power seats, power locks/windows/mirrors, tilt wheel, cruise control, factory trailer brake controller, power and heated and folding trailering mirrors, pedal height adjustment, block heater, park assist, exhaust brake, heated steering wheel, alloy wheels, bed liner, tow package, etc. Come check it out! WARRANTY: THIS TRUCK CARRIES THE REMAINING BALANCE OF THE MANUFACTURER'S 60 MONTH OR 100,000 MILE DRIVETRAIN WARRANTY. ASK DEALER FOR DETAILS.